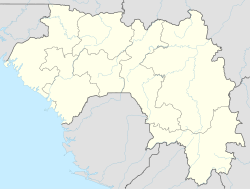 Doura is a town and sub-prefecture in the Kouroussa Prefecture in the Kankan Region of eastern-central Guinea. As of 2014 it had a population of 18,675 people. ^ "Subprefectures of Guinea". Statoids. Retrieved April 19, 2009. ^ "Guinea". Institut National de la Statistique, Guinea, accessed via Geohive. Archived from the original on 24 November 2015. Retrieved 12 September 2014. This page was last edited on 17 March 2017, at 01:32 (UTC).